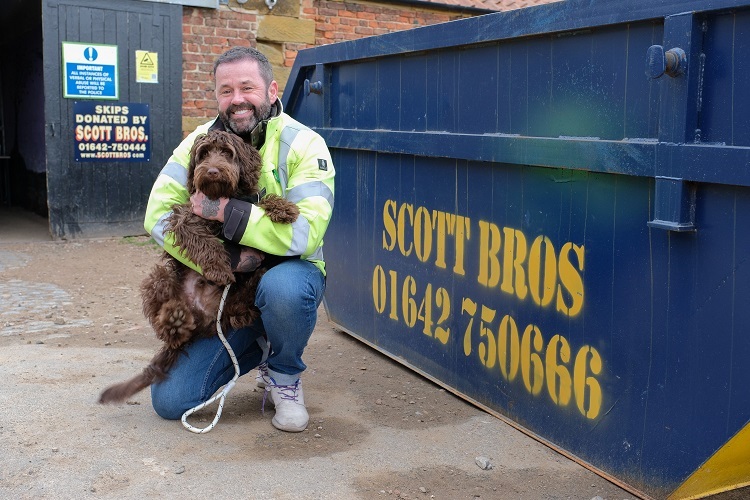 A VOLUNTEER-run centre for rescued dogs has received a rather unusual offer of support from recycling experts, Scott Bros. The Teesside-based family-run firm agreed to provide a free skip service after learning that Maxi’s Mates was having difficulty disposing of its general waste. The skip-aid offer came after the rescue and rehoming centre was left with piles of ruined dog bedding, after rainwater seeped through a storm-damaged roof. Canine-loving Scott Bros. agreed to provide the service free of charge whenever the centre, at Carlin Howe Farm, between Guisborough and Redcar, requires it. The offer is proving particularly useful as the centre’s band of 40-strong volunteers continue to clean up after the storm, as well as disposing of building waste created by ongoing work to expand and improve the kennel’s facilities. It costs up to £4,000 per month to run Maxi’s Mates, with the majority of the money devoted to heating, dog food, veterinary care and rent. During 2018, Maxi’s Mates, which also operates the stray dog contracts for Redcar & Cleveland and Hambleton councils, took in 261 strays, of which 146 were reunited with their owners and 107 were successfully rehomed. The eight remaining dogs are still being cared for by the centre. Jane Galliford, who founded the charity in 2012 with Michelle Cooper, said the majority of its funding comes via donations and charity fundraisers. David Scott Jr, a Director at Scott Bros., said: “I’m a dog owner myself and once you’ve visited Maxi’s Mates and see the work they do, it’s only natural to want to help. “In fact, while I was delivering the skip, I completely fell for a beautiful six-month-old Cockapoo and, after undergoing all the necessary checks, I’ve adopted him and named him Logan after the X-Men character! Jane said that the skip-aid offer came at an opportune time, after a large number of quilts, blankets and towels donated for dog bedding were ruined by the storm damage. The centre, which currently has 36 kennels, also receives offers of help from a variety of local businesses and organisations. Most recently, trainees and tutors from the Teesside Skill Centre operated by training and education specialists, Learning Curve Group, volunteered to help build an isolation area for newly-arrived strays.